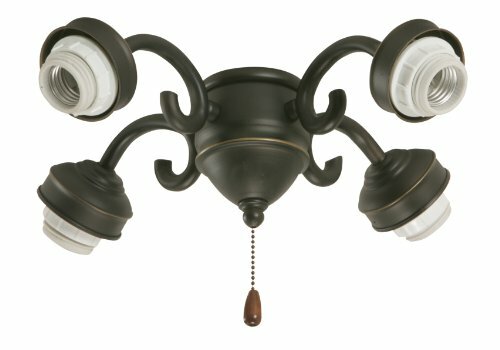 This Emerson 4-Light Transitional Fitter in Oil Rubbed Bronze features stylish curved details to complement the fitter's traditional design. Easy to install, this ceiling fan light fitter is 13-1/2-inches wide by 6-1/2-inches high and includes 4, 13-watt medium base compact fluorescent bulbs. This fitter gives you more options to customize your Emerson ceiling fan; simply match your favorite fitter with one of our glass selections for a personalized look (glass sold separately).